OUR 39TH YEAR IN 2019! 6 METER FM REPEATER COMING IN SUMMER 2019. PROVIDING THE BEST IN ANALOG FM REPEATER SYSTEMS. "NO DIGITAL REPEATERS HERE. WE'RE OLD SCHOOL." "LOCK IT IN AND RIP THE KNOB OFF!" KØGDI 144.390 APRS WIDE COVERAGE DIGI / I-GATE. ABOVE ARE MY QSL CARDS, EYEBALL QSL CARD, AND MY ARRL 40 YEAR MEMBERSHIP PIN RECEIVED IN 2015. CLICK THE PICTURE BELOW FOR THE LIVE CAMERA. IF YOU WOULD LIKE TO DONATE TO THE GROUP, PLEASE USE THE BUTTON ABOVE. NO OBLIGATION. 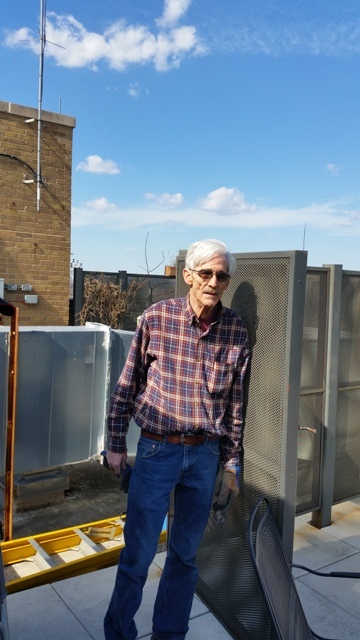 ANY DONATIONS RECEIVED WILL GO ENTIRELY TO DEFRAY THE MAIN REPEATER SITE EXPENSES. WE THANK YOU FOR YOUR SUPPORT. IF YOU HAVE ANY QUESTIONS REGARDING YOUR DONATION, PLEASE DO NOT HESITATE TO EMAIL WBØQXW HERE. CURRENT HAMVENTION 2019 TEAM: WBØQXW, KØGDI, KCØMAM, ADØXV, N9VHL, KEØYW, WBØAL. 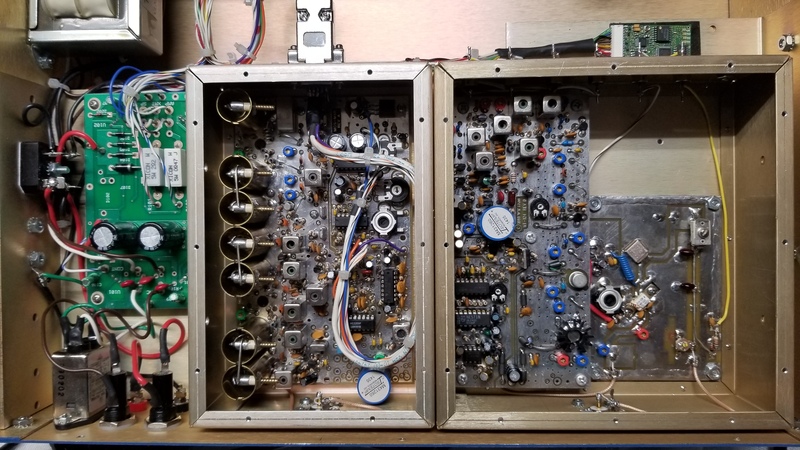 THE 6 METER REPEATER IS READY AND WILL BE PICKED UP AT HAMVENTION 2019. IT HAS BEEN DECIDED THAT THAT 444.150 AMP WILL REMAIN AT 100 WATTS. THE SYSTEM WORKS BETTER OVERALL. PROGRAMMING CHANGES HAVE BEEN MADE TO 145.210 AND 444.150. CONTACT WBØQXW FOR INFO. 145.210 AND 444.150 OPERATIONAL TIMES HAVE BEEN CHANGED. THEY ARE ON AT 7:00 AM AND OFF AT 12:00 MIDNIGHT. THE 444.150 REPEATER HAS BEEN PLACED ON TEMPORARY ACCESS RESTRICTION. CONTACT WBØQXW FOR INFO ON USING IT. OUR GROUP MEETS ON THE FIRST TUESDAY OF EACH MONTH FOR DINNER. CONTACT A MEMBER FOR DETAILS. NEXT DINNER IS MAY 7TH. 145.210 IS STREAMING LIVE VIA BROADCASTIFY. (FEED ON THIS PAGE.) THE AUDIO WILL BE DELAYED BY AN AVERAGE OF 30 SECONDS. PICTURED ABOVE ARE THE FIRST PHOTOS OF THE NEW 6 METER REPEATER. OTHER PHOTOS COMING SOON. FCC STREAMLINES PART 95. INCLUDING GMRS, FRS, AND CB RADIO. CLICK HERE FOR THE DETAILS. 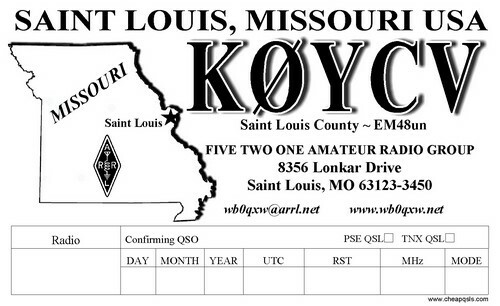 CLICK HERE - ST. LOUIS AREA AMATEUR RADIO ORGANIZATIONS. CLICK HERE TO GO TO THE UPDATED PHOTOS AND VIDEOS PAGE. 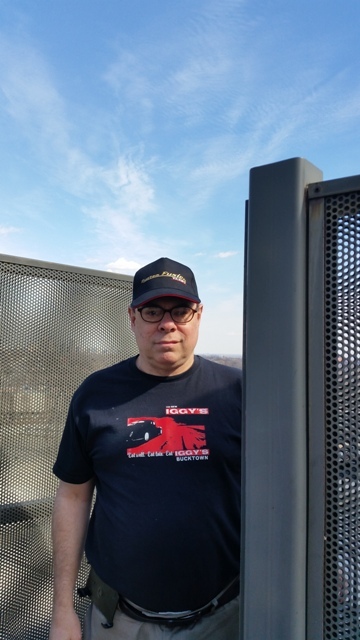 My name is Bob Garavaglia, WBØQXW, and I have been a Ham Radio Operator since 1975. Welcome to the 521 Amateur Radio Group (521 ARG) webpage. 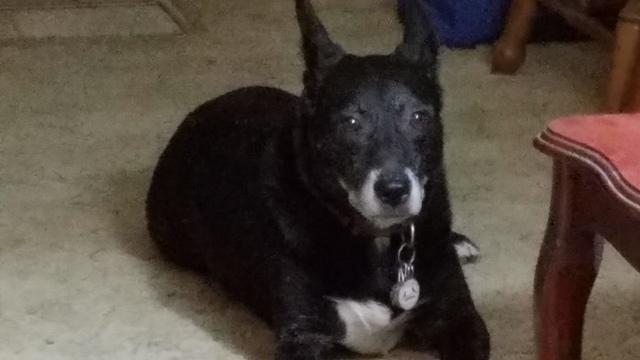 All the members of my immediate family are also Hams. They are, my brother Carl, KAØPWL; my sister Judy, NØIIY; and my brother-in-law Ron, NØIIZ. Our group also has a club call sign, KØYCV for use in group activities such as Field Day or camping trips. Our club call sign is now a vanity call sign once held by my father for over 56 years. A perfect way to have his call sign live on as a tribute to him. I also hold an Advanced license in Australia with the call sign of VK2STL, which I have held for over 28 years. The advantage of our group is that there are no club rules. No board of directors. No elections. No mandated dues. No politics that are associated with some clubs in the area. (No names here. Sorry! You are free to guess which ones.) 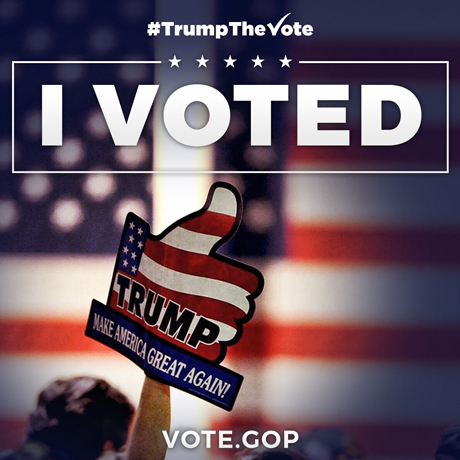 There is no "voting" up or down any person who wants to be part of the group. Everyone is treated the same. Everyone respects each other. Everyone is welcome on our repeaters and at our social activities. This has been the case for over 39 years and will remain so. This is a judgment free zone. Anyone who disagrees with these policies is free to move on to join other groups or clubs. If you are new to Amateur Radio, the members of our group will be glad to assist you with the hobby. The group is quite diverse and between the members we all have years if not decades of experience. From VHF and UHF to the low bands, antennas to repeaters, mobile operating to equipment advice. We can help you. 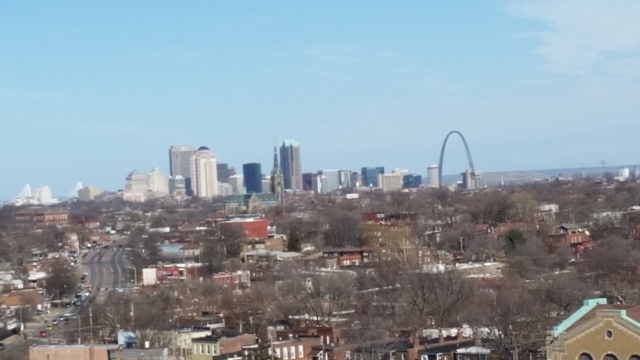 The 521 ARG has operated two repeaters in the St. Louis, MO area for 39 years. They are the 145.210 and 444.150 repeaters. Over the years the machines have been updated and serviced to provide excellent coverage and reliability. 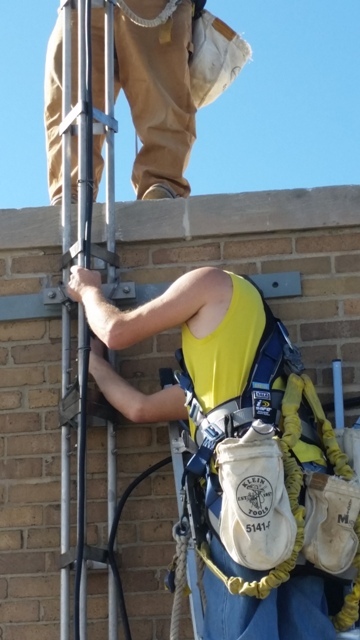 In 2006, our repeater site underwent six months of renovations as well as equipment upgrades and modifications including the repeater controllers, receivers, and transmitters. In July, 2009, Echolink was added to the system on the VHF side. Many thanks to John, K1IF for providing the assistance to get it up and running. More information on Echolink is further down this page. 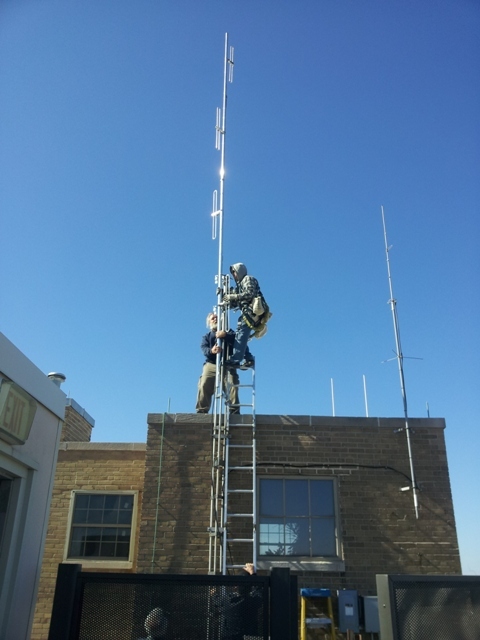 In October, 2014, a new antenna for our 145.210 repeater was installed. 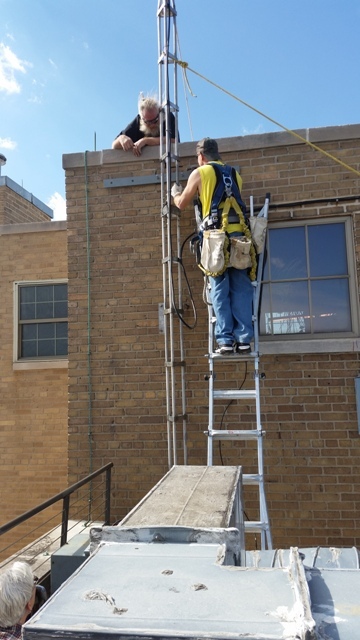 A 25 foot commercial VHF antenna from Andrew Communications to provide even better coverage to our wide area system. The model is a Andrew DB224-E 6 db gain 138 - 150 MHZ broadband antenna. 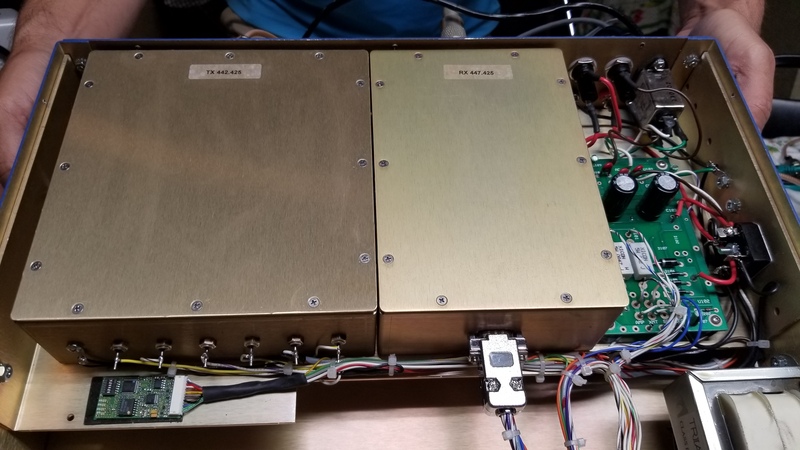 A new TX-RX duplexer provided by Bird Electronics for 145.210 was installed on January 9, 2016. In August, 2016, a new antenna from PCTEL, a commercial 7 db omni was installed on our UHF repeater, 444.150. 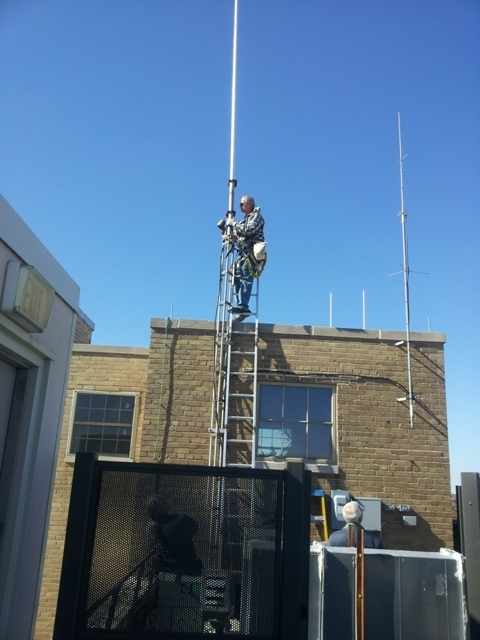 The UHF repeater also has been recently serviced and updated. 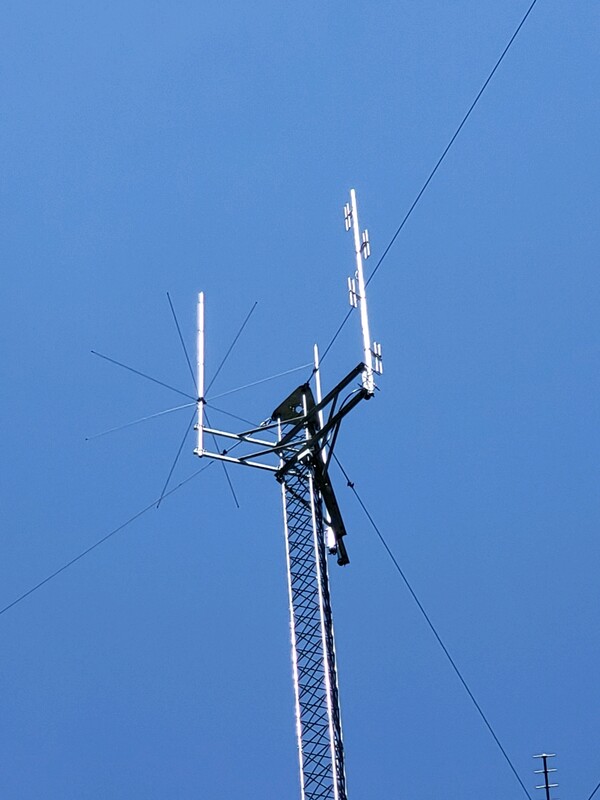 A new UHF TX-RX duplexer provided by Bird Electronics was installed in September, 2016. 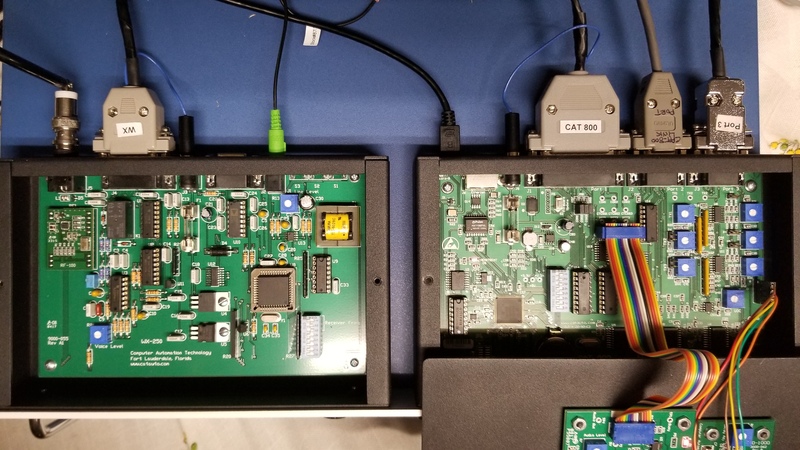 145.210 now has the new CAT 800 controller and weather receiver along with internet connectivity. The repeater now has more control and update flexibility. The new WAV player has great sounding voice ID's and announcements played directly from a WAV file. The 444.150 repeater is now converted to the CAT 800 controller. 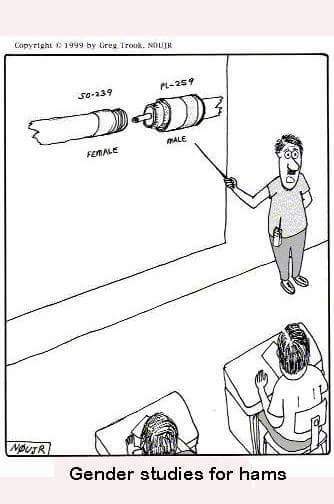 The only difference between the two is that there will be no weather receiver. All features will be the same. Our site also houses our third system, a commercial Kenwood GMRS band UHF repeater on 462.725. My GMRS license is WPXG847. If you would like information on using GMRS, please contact me. A ten year license for $70.00 is required. The fee was reduced by $20.00 in September, 2015 by eliminating the regulatory fee associated with the license. See the FCC website for details. The rules are covered in FCC part 95. One license covers your family members. A unit number for each person is assigned and approved by the system owner. Permission to use the system is required. The FCC streamlined the part 95 rules. See the link on this page for further details. 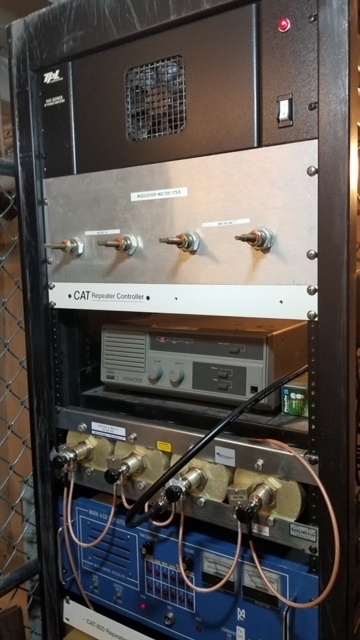 At the Washington County repeater site, in summer 2019, we will be adding a high profile 6 meter FM repeater with a CAT 800 controller. The output frequency is 53.410 mhz. This machine will be linked full time to the 145.210 repeater. 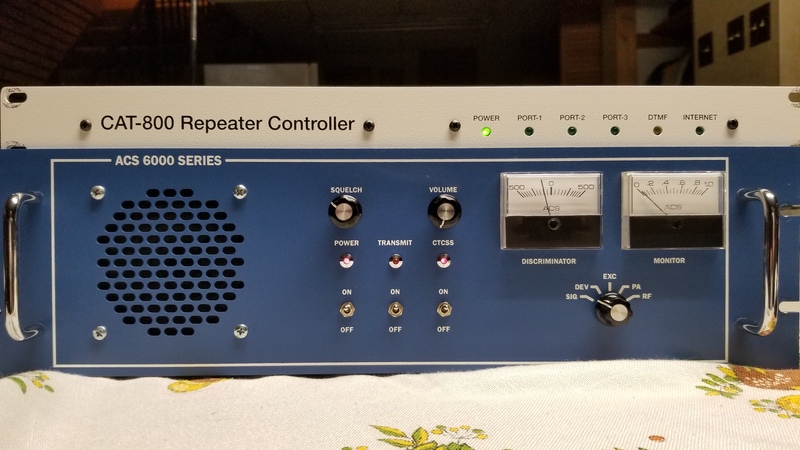 Construction has been completed on the repeater portion and it will be picked up at Hamvention 2019. The duplexers and amplifier will be ordered soon. Once ordered there is a six week lead time on both. Stay tuned! The upgrades to all of the repeaters (Except GMRS.) will enable us to keep up with the latest analog RF and controller technology, improve reliability, and improve our already outstanding coverage with the addition of the new 6 meter repeater. Thanks to all the individuals who have helped and supported our group over the last 39 years. We could not have gotten this far without you. You know who you are. There has been a lot of changes over the years and we keep going. 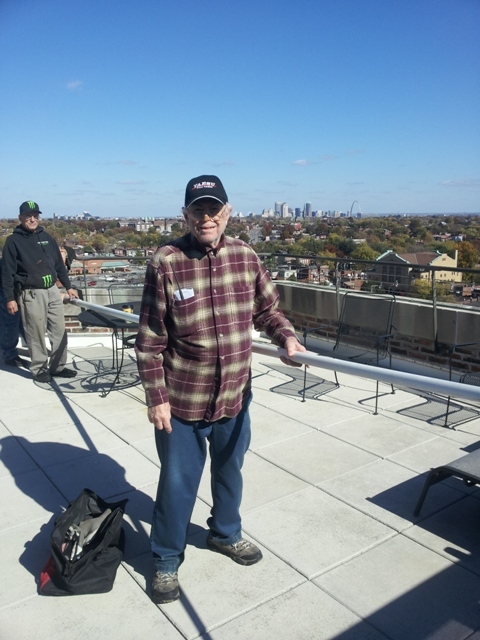 I have been a regular attendee at the Dayton Hamvention® since 1977. 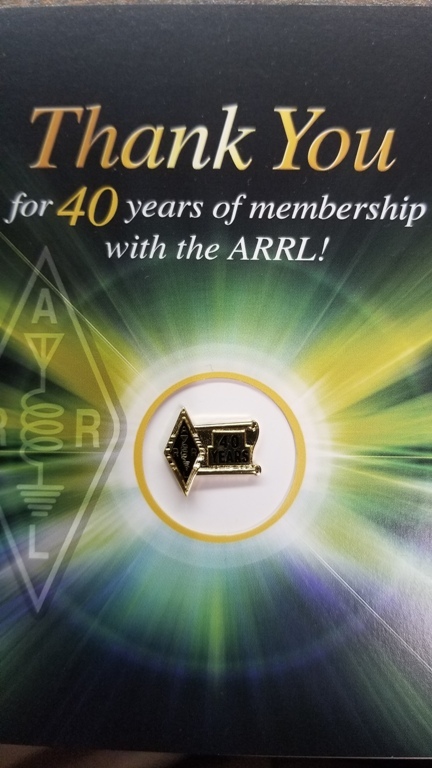 I have been a member of the ARRL since 1975. The group has an eyeball on the first Tuesday of the month at 6:30 pm. The location is in the South County area. Contact one of the group members or monitor 145.210 for the location. You can also locate members of the group via APRS. Try (call)-5 or (call)-9. 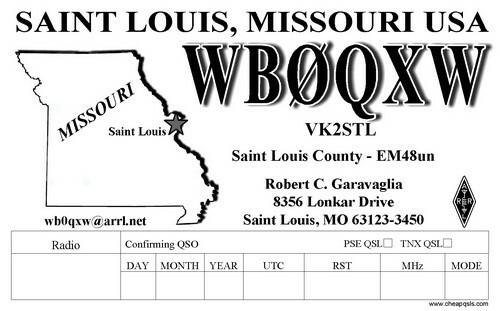 If you would like to contact me, send an email to wb0qxw@arrl.net. The Echolink remote base for 145.210 consists of a Kenwood V71A transceiver with the built in node controller, an HP Desktop running Windows 10 with the Echolink software, and linked to the Echolink network via a 215 megabit internet connection provided by Spectrum. The remote base also has a battery backup. For details about accessing the node via the RF link, email me. Anyone can access the system as long as I know who requests the information and that you have the proper FCC license to do so. Keep in mind that you must follow my policy regarding access. A control operator may intervene if there is a violation. This is done so that everyone has a chance to use the system. The 145.210 node number is 466277. For more information on Echolink visit echolink.org. 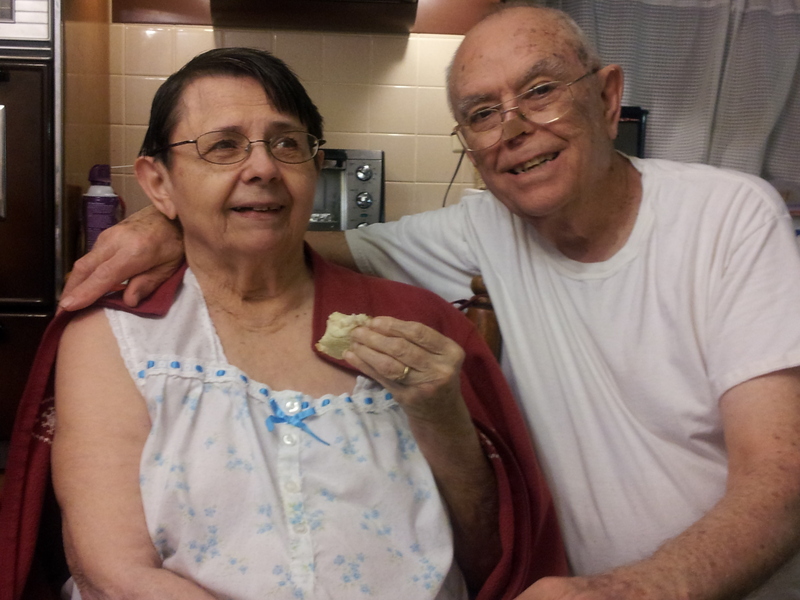 On Monday nights, (145.210) we participate in the World Friendship Net on Echolink. Feel free to check in. If you check in via Echolink, go to the World Conference Server in the conference listings. Newsline will follow the net. Click here for more info on the World Friendship Net. The ARRL Store has a great book on Internet linking. Click here to order it. It's written especially for Echolink. Also others such as IRLP. Nifty Ham Radio Accessories publishes the Nifty E-Z Guide to Echolink Operation. Click here to order it. For those that have an Android phone, there is an app in the Play Store called "Echolink Finder". This free app is a great for locating a node near you. It is based on your GPS location. The 21 node is listed. Also, two more apps of note: "Repeater Book", and "RFinder". Available for Android and iPhone. These are repeater databases. The RFinder App requires a US$9.99 yearly subscription and can also be accessed on the web. They use your GPS location to get you the repeaters and nodes closest to you. RFinder is the official repeater app of the ARRL. Although the ARRL Repeater Directory of which RFinder is a part of is NOT worth the paper it's printed on. The old format and content were much better. I do not recommend it. Repeater Book is free. Go to these links for further info: RFinder, Repeater Book, and Echolink Finder. For those who use APRS, or who want to locate an operator who is currently tracking, click here to find their location. PAUL M. GARAVAGLIA, KØYCV 1931 TO 2016. LEFT, DOLLY, WBØSDZ, AND PAUL, KØYCV IN NOVEMBER, 2014. RIGHT, IN A PICTURE TAKEN JULY 23, 2007. CLICK HERE TO LISTEN TO THE ARRL HAM RADIO PSA FROM 2005. 145.210 and 444.150 ACS 6000 REPEATER INSIDE CHASSIS VIEW. RIGHT PHOTO: POWER SUPPLY, RECEIVER, TRANSMITTER. PL DECK (UPPER RIGHT). THE ACS SYSTEM ALONG WITH CAT AUTOMATION IS BY FAR THE BEST THERE IS ANYWHERE. THE BEST PERFORMANCE AND RELIABILITY. END OF STORY! ANYONE WHO SAYS OTHERWISE SIMPLY DOESN'T KNOW REPEATER SYSTEMS LIKE WE DO. OUR TRACK RECORD FOR 39 YEARS PROVES IT! LEFT: THE 150 FOOT TOWER SITE IN BLACKWELL, WASHINGTON COUNTY, MO. 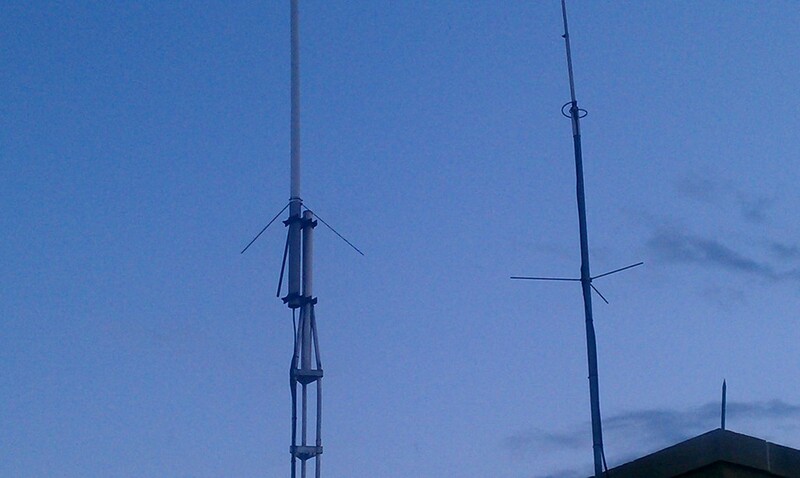 RIGHT: THE NEW 53.410 REPEATER ANTENNA IS ON THE LEFT SIDE ARM AT THE TOP OF THE TOWER. 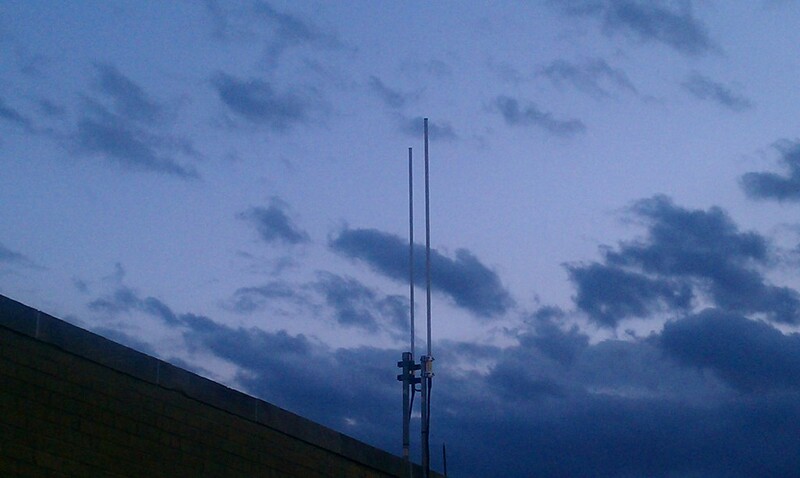 ALSO IN THE RIGHT PICTURE, THE 2 METER APRS DIGI-PEATER ANTENNA ON THE RIGHT SIDE ARM, AND THE UHF BASE ANTENNA IN BACK. REMINDER: BOTH THE 145.210 AND 444.150 REPEATERS ARE TURNED OFF BETWEEN 12 MIDNIGHT AND 7:00 AM EACH DAY. NOTE: THE 145.210 WEATHER RECEIVER WILL TRANSMIT ALERTS EVEN THOUGH THE REPEATER MAY BE OFF. 145.210 AND 444.150 HAVE THE SAME CONTROLLERS. HOWEVER THEY ARE INDEPENDENT OF EACH OTHER. 35 AMP HOUR EMERGENCY POWER BACKUP BATTERIES AND POWER SUPPLY / CHARGER INSTALLED. 145.210 REPEATER EMERGENCY RF POWER OUTPUT IS 10 WATTS. THE MAIN REPEATER SITE HAS INTERNET CONNECTIVITY FOR REPEATER CONTROL AND GOOGLE VOICE SERVICE. THE FAMOUS CLASSIC VOICE ID'S MADE AT KMOX RADIO IN 1985 ARE NOW LOADED ON TO BOTH CAT 800 CONTROLLERS. 27 OF THEM. 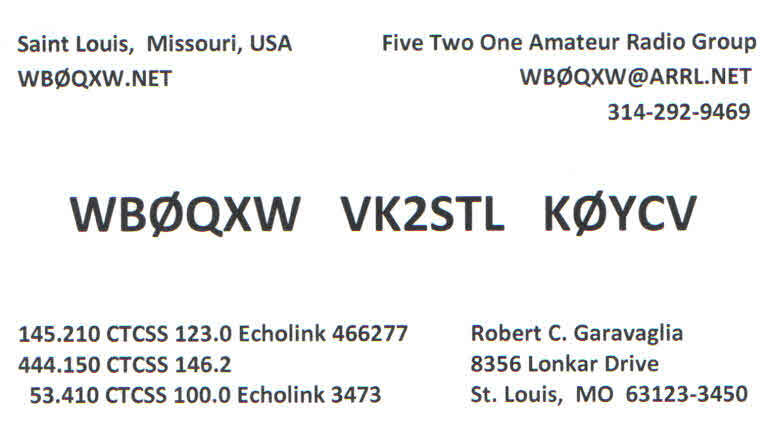 WBØQXW WAS FEATURED ON AN AMATEUR RADIO NEWSLINE ID BREAK. CLICK HERE TO LISTEN TO IT. 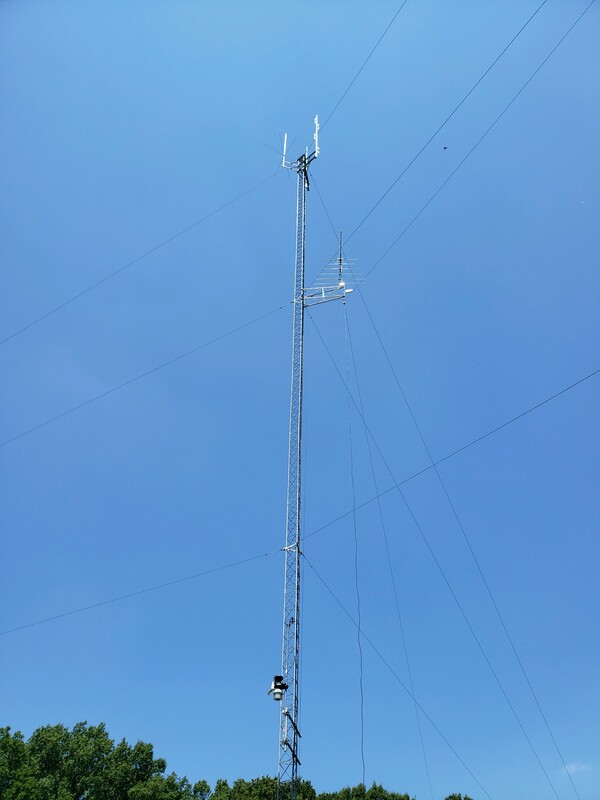 A 400 FOOT TOWER IS BEING PLANNED AT THE WASHINGTON COUNTY REPEATER SITE. CONSTRUCTION TO BEGIN SPRING OF 2020. 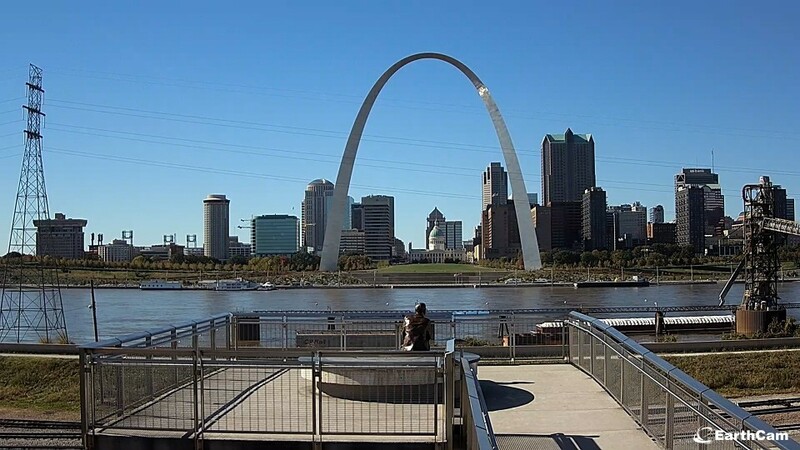 PROVIDING THE BEST REPEATERS, RELIABILITY, AND COVERAGE IN THE ST. LOUIS METRO AREA SINCE 1980. 145.210: "THE BLOWTORCH" ONLINE. 165 WATTS TO ANTENNA. 6 DB GAIN. 660 WATTS ERP AT 765 FEET ASL. PROGRAMMING CHANGES HAVE BEEN MADE TO THE REPEATER. CONTACT WBØQXW FOR INFO. WE HOPE THIS IS A TEMPORARY SITUATION DUE TO MALICIOUS INTERFERENCE. 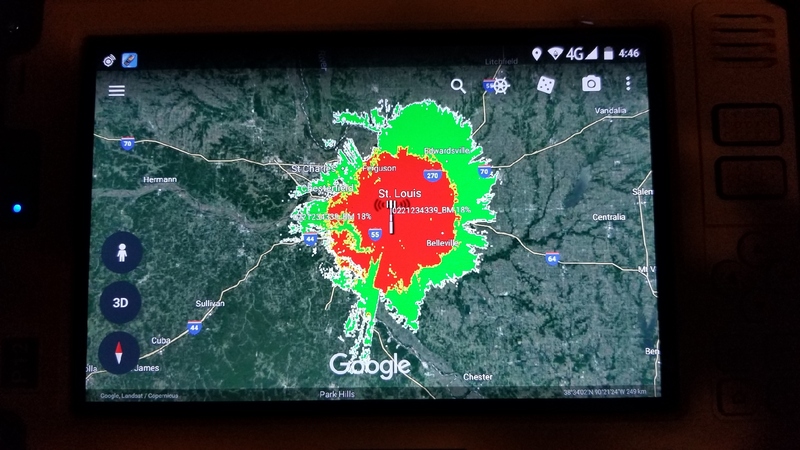 CONTROLLER UPGRADE INCLUDES THE CAT 800, AND WEATHER RECEIVER FOR ST. LOUIS AREA ALERTS. PLEASE USE CTCSS TONE 123.0 FOR INBOUND. OUTBOUND IF NEEDED. CTCSS TONE 123.0 ON TRANSMIT CARRIER IS RECEIVE AUDIO ONLY. ECHOLINK IS OPERATIONAL AND CAN BE ACCESSED ON NODE NUMBER 466277. WORLD FRIENDSHIP NET EVERY MONDAY NIGHT 7:00 PM. FOLLOWED BY NEWSLINE. VIEW THE 145.210 LISTING ON REPEATERBOOK.COM. PRESS PLAY TO HEAR THE FEED. MAKE SURE FLASH IS ALLOWED (TURNED ON) IN YOUR BROWSER SETTINGS. IF YOU DO NOT SEE THE PLAYER, UPDATE YOUR FLASH PLAYER. CLICK HERE. ALSO, JAVA CAN BE UPDATED BY CLICKING HERE. 444.150: "MINI BLOWTORCH" ONLINE. 100 WATTS TO ANTENNA. 433 WATTS ERP AT 765 FEET ASL. THE UHF REPEATER HAS BEEN PLACED ON RESTRICTION. CONTACT WBØQXW FOR THE ACCESS INFO. THE REPEATER REMAINS OPEN FOR USE. HOWEVER SPECIAL ACCESS IS REQUIRED. 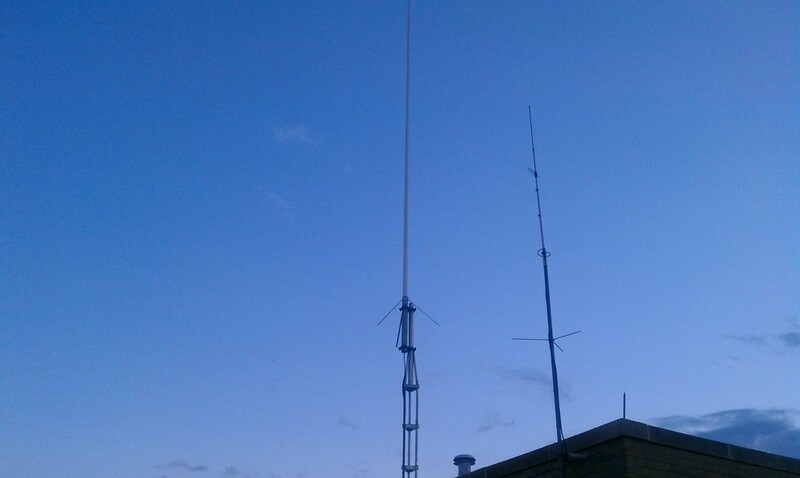 PCTEL 7 dbi OMNI UHF ANTENNA INSTALLED FOR BETTER COVERAGE. BIRD TX-RX DUPLEXERS INSTALLED TO IMPROVE PERFORMANCE. THE REPEATER IS NOW CONVERTED TO THE CAT 800 AND IS OPERATIONAL. NO WEATHER RECEIVER. 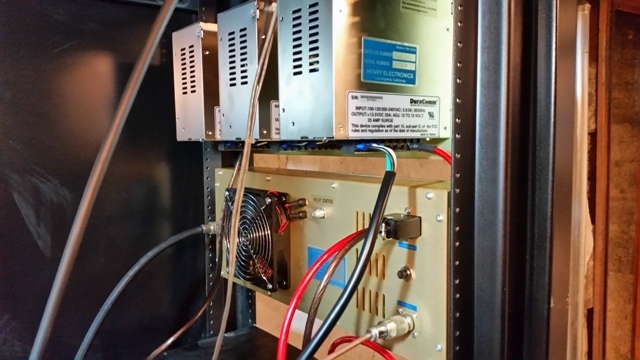 THE UHF REPEATER IS NOW ON CTCSS FULL TIME. USE TONE 146.2 INBOUND. OUTBOUND IF NEEDED. CTCSS TONE 146.2 ON TRANSMIT CARRIER IS RECEIVE AUDIO ONLY. VIEW THE 444.150 LISTING ON REPEATERBOOK.COM. 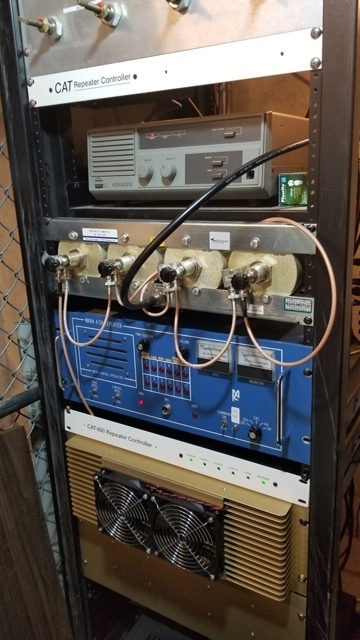 462.725: THE GMRS COMMERCIAL REPEATER IS ONLINE AND OPERATING NORMALLY. ACCESS IS RESTRICTED. A GMRS LICENSE AND USE PERMISSION IS REQUIRED. 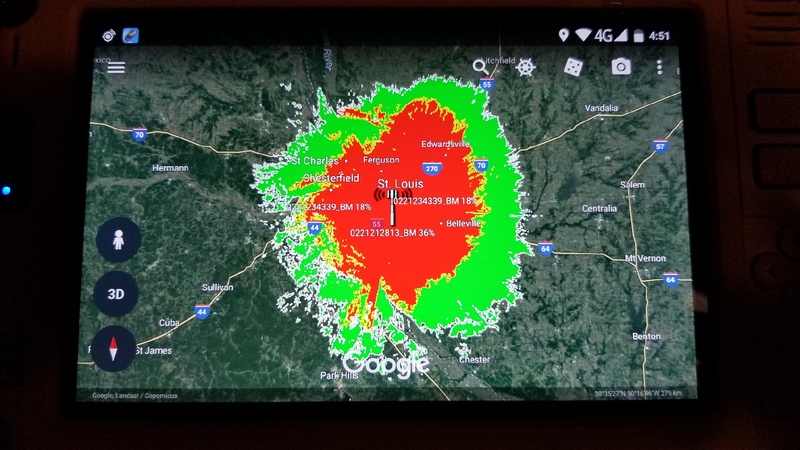 NOTE: OUR GMRS REPEATER CHANNEL IS SHARED WITH A MACHINE IN COLLINSVILLE, IL. 53.410: CONSTRUCTION IS COMPLETE ON THE REPEATER ONLY. PICK UP AT HAMVENTION 2019. SIX METER ANTENNA AND SIDE ARM HAS BEEN INSTALLED ON THE 150 FOOT TOWER. 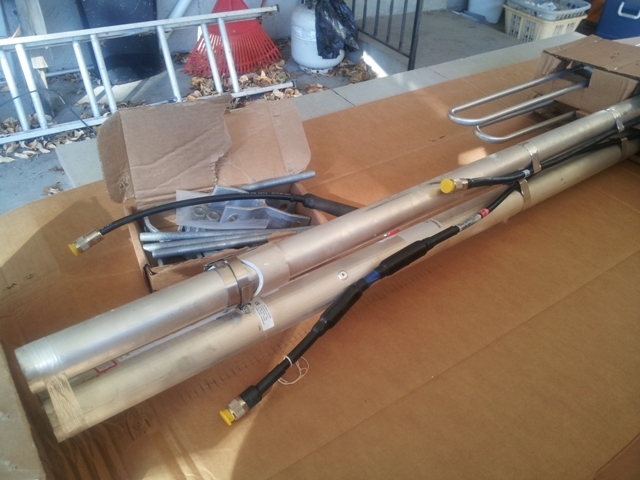 THE 6 METER DUPLEXERS WILL BE ORDERED SOON AND SHIPPED FROM TX-RX IN BUFFALO, NEW YORK. THE SIX METER PREAMP HAS ARRIVED AND IS INSTALLED ON THE TOWER. THE BEKO 6 METER REPEATER AMPLIFIER WILL ALSO BE ORDERED SOON AND WILL RUN AT 300 WATTS. THE 50 AMP ICS RACK MOUNTED POWER SUPPLY HAS ARRIVED ON SITE. ON THE AIR DATE NOW SCHEDULED FOR SUMMER 2019. STAY TUNED FOR FURTHER UPDATES. THE REPEATER WILL HAVE THE CAT 800 CONTROLLER AND WEATHER RECEIVER. THE REPEATER WILL BE LINKED TO 145.210 FULL TIME ON ECHOLINK VIA KØGDI-R.
KØGDI 144.390 WIDE AREA COVERAGE DIGI / I-GATE NOW ONLINE. OUTPUT 45 WATTS TO AN ANDREW 6 DB ANTENNA AT 1020 FEET ASL. ON THE 150 FOOT TOWER IN BLACKWELL, MO. LEFT: THE 145.210 REPEATER COVERAGE AREA ESTIMATE. RIGHT: THE 444.150 REPEATER COVERAGE AREA ESTIMATE. 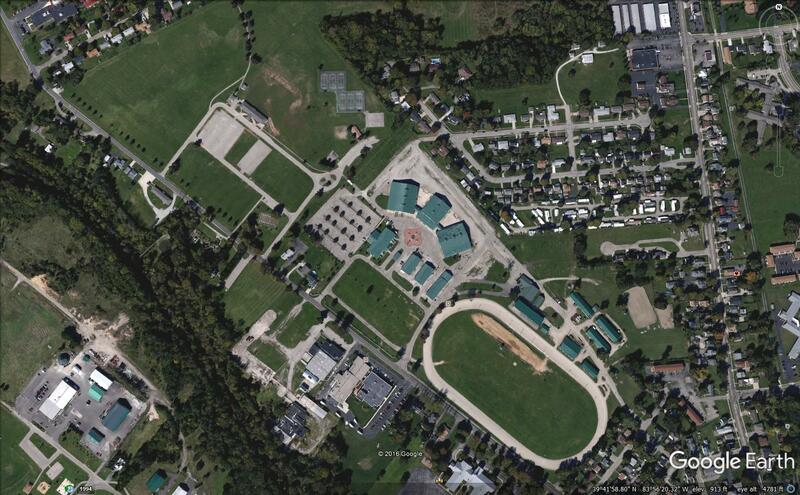 The Greene County Fair Grounds in Xenia, Ohio. 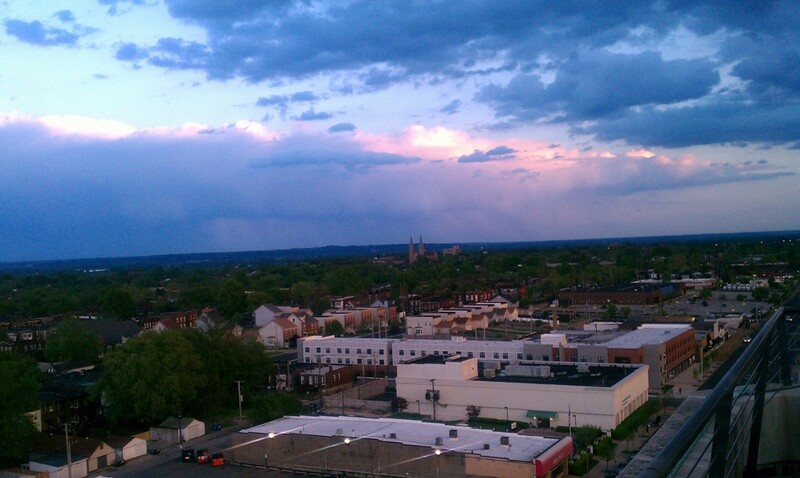 The new site of Hamvention®. Click here for HAMNATION. The weekly Internet show with host Bob Heil, K9EID. Go to W5KUB.COM to view the live stream from Hamvention! As well as other shows. Please sign my guestbook. Click the button below. Thanks. Above are the repeater site roof pictures. 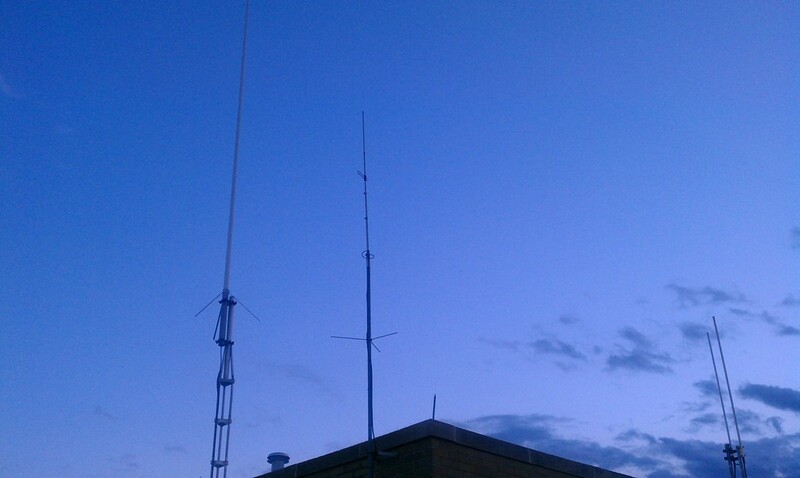 Shown from the left is the old 145.210 antenna, the 220 mhz receive antenna, the 444.150 antenna, and the GMRS UHF antenna. 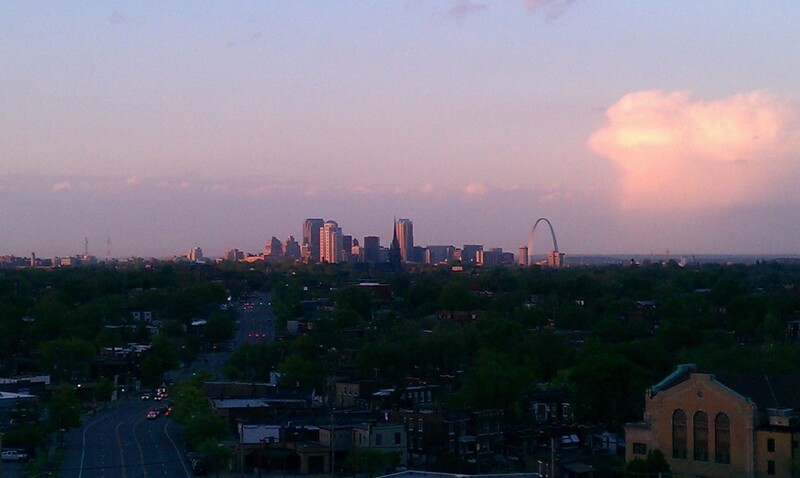 Followed by roof view photos, including the downtown skyline with the Gateway Arch and a rain storm. All the antennas are connected via 225 feet of half inch hardline. Height above sea level is 765 feet at top of the VHF antenna. Click on thumbnails to view. 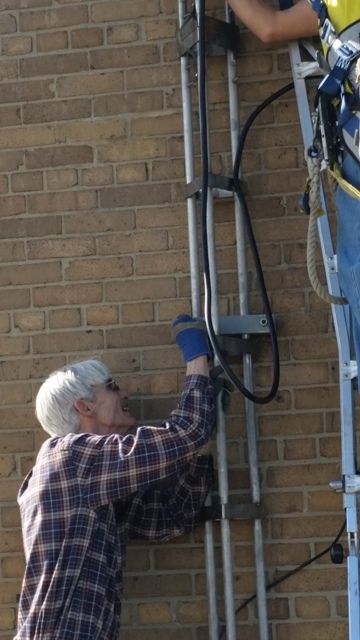 Above are the pictures of the new 145.210 antenna installation. (Andrew DB224-E 6 db gain 138 - 150 MHZ broadband antenna.) October, 2014. 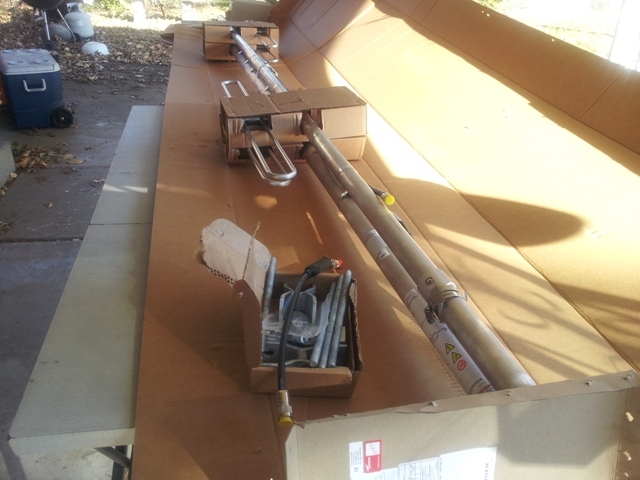 Left to right: The unpacking of the new antenna, new antenna assembled on roof, removal of the old antenna, KØYCV and KDØYYG holding the old antenna, and the new antenna going up. Click on thumbnails to view. 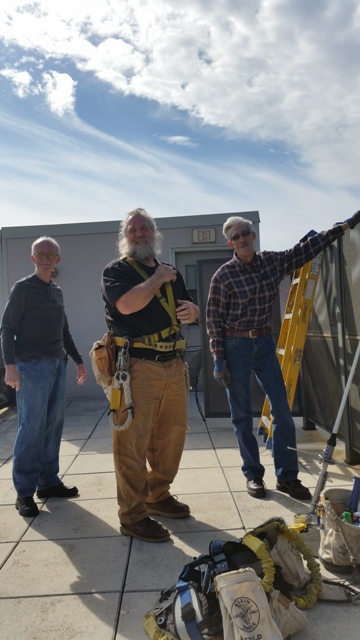 Tower work project on February 19, 2016: Left to right. Picture 1: Micky KBØZVB, Rick Schutt (SGR Inc.), Ken KØKYZ. Picture 2: Ken KØKYZ. Picture 3: James KB9MQI, Pete AIØI. Picture 4: Bob WBØQXW. Picture 5: Gary (SGR Inc.) and Rick (Up top.) work on the tower attaching the main steel plate. Picture 6: Close up of picture 5. Picture 7: Ken KØKYZ bolts one of the steel plates. 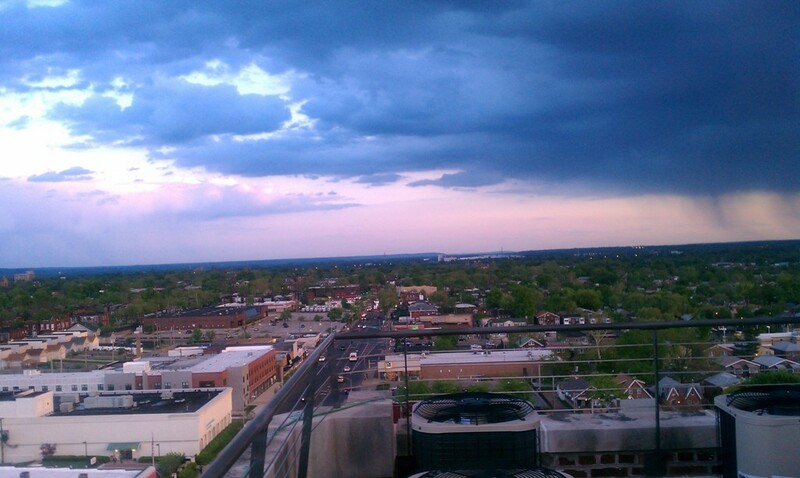 Pictures 8 and 9: Shots of the roof view. 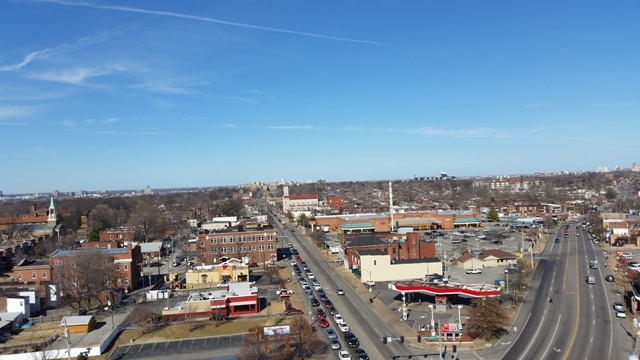 Looking to Downtown and North up Grand with Gravois on the right. Click on thumbnails to view. Above are photos of the equipment racks taken on March 22, 2018. Left to right is the VHF rack for the 145.210 repeater. Top down: Henry 75 amp amplifier power supply, 250 watt Henry Amplifier, control receiver, CAT-800 controller rack with activity status lights, 21 main rack, TX-RX duplexers. Next is the UHF rack for the 444.150 and 462.725 (GMRS) repeaters. 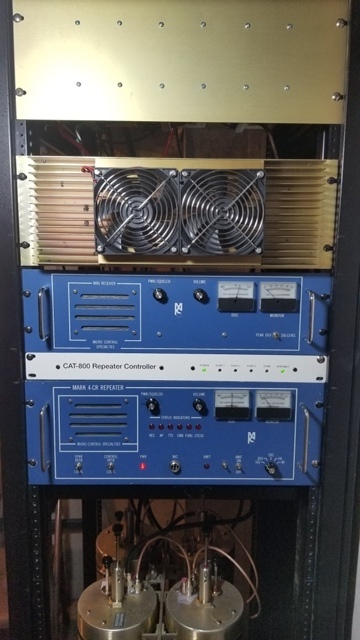 Top down: GMRS duplexers, GMRS CAT-200B controller, GMRS Kenwood TKR-820 repeater, UHF TX-RX duplexers, UHF main rack, UHF CAT-800 controller rack with activity status lights, UHF 100 watt Henry amplifier, 50 amp Henry power supply. Next is the top of the same rack with the GMRS 50 watt TPL commercial amplifier. Last picture is the back view of the 145.210 Henry power supply and amplifier. Click on thumbnails to view. WBØQXW checks the installation of the new duplexers. 01-09-16, IFR 1200S service monitor, Bird 4304A single element 5 to 500 watt 25 mhz to 1 ghz wattmeter. Click here to see our selection of group photos and videos on Ham Radio and other related content. Look up amateur's callsigns via QRZ.COM using the form below. Need to do a search on Ham Radio? Try the Google Search above. CLICK ON THE BANNER ABOVE TO GO TO THE HAM TALK LIVE WEBSITE TO HEAR THE PODCASTS! WBØQXW recommends repeater amplifiers by Henry Radio. Located in Los Angeles, CA USA. The best in the business! Click the banner below. 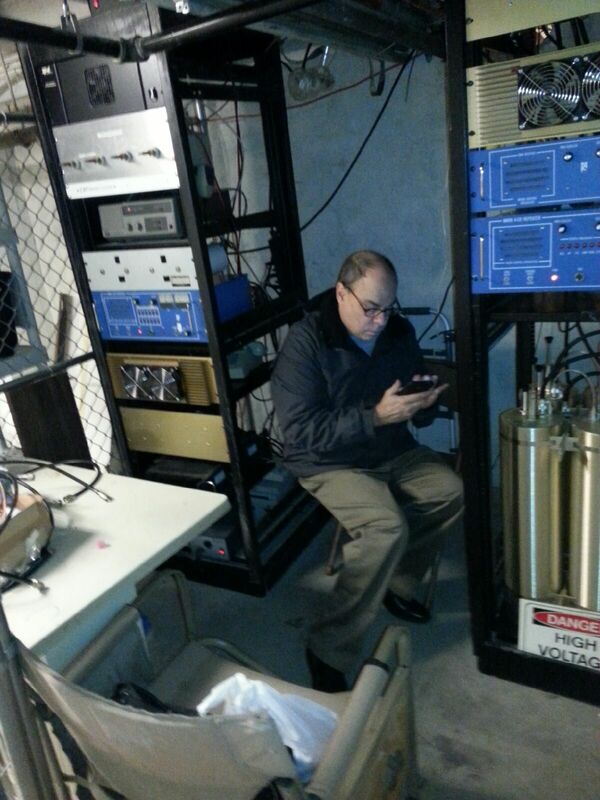 WBØQXW recommends repeater equipment from Advanced Communication Systems in Chester, NH, USA. Click here for information. ACS has been providing repeaters and service to the 521 ARG since 1982. The best in the business! The secret behind our success. It speaks for itself! Their address and phone are, Advanced Communication Systems, 17 Haverhill Road, Chester, NH, 03036. Phone: 978-372-3442. Ask for Gary. WBØQXW recommends CAT repeater controllers. Click the link above for information. 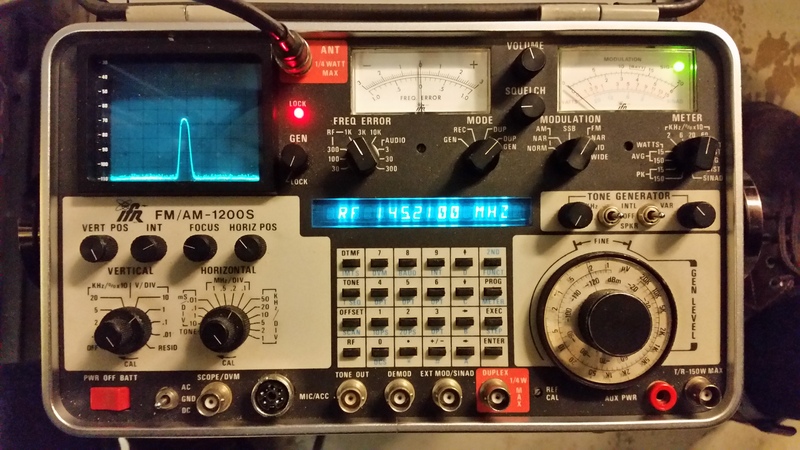 Buy the best in Amateur Radio equipment. Click the banners above. GENERAL MOBILE RADIO SERVICE: THE FOLLOWING 521 ARG MEMBERS ARE LICENSED FOR GMRS. BOB (WBØQXW) WPXG847, GREG (KØGDI) WQXQ897, MICKY (KBØZVB) WRBM660, PAUL (KBØVTK) WQGY451, MARK (NØMMM) WQNI500, KRIS (KEØJZE) WQYB847, CHRIS (N9VHL) WPXH982, RON (NØNSP) WQYS593, ROYCE (NØJLO) WQYY781, MIKE (KDØBQS) WQZG357, ANDREW (KEØOUO) WQZH864, STEVE (NØOWF) WRAM643, PETE (AIØI) WQYN792, JERRY (KEØYW) WRCX779. 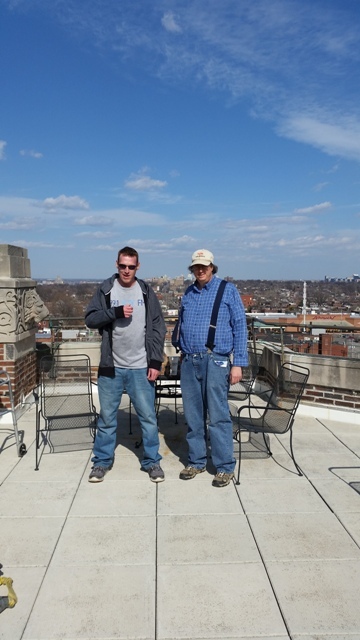 ST. LOUIS CITY REPEATER SITE CREW (145.210, 444.150, 462.725): WBØQXW, KBØZVB, KBØVTK, KØGDI, KØKYZ, KEØJZE, KDØBQS, AIØI. ADØXV. WASHINGTON COUNTY REPEATER SITE CREW (53.410): KØGDI, KCØMAM. REPEATER CONTROL OPERATORS: WBØQXW, KØGDI, KEØJZE, KDØBQS, KIØTTY. APRS NODES: KØGDI, KDØBQS, KEØJZE. Thank you to the Ham Radio operators listed below who currently support, or have supported the 521 ARG in the past. WBØQXW, KAØPWL, NØIIY, NØIIZ, KBØVTK, K1IF, KC9MTF, WA9NE, KAØJCU, NY9X, KK2G, KN9G, W9KTO, KG9IR, KVØW, WAØS, NØFNF, WA9SQE, NØHDQ, NØQNV, KAØRGI, KBØRQJ, ADØAJ, NB9E, AAØQE, AIØI, N9NJS, KAØQQN, KBØENM, KAØRFO, KBØZVB, NØVGG, WBØLSR, N9IDD, NØMMM, WAØKUZ, KØGDI, KCØMAM, KBØUPN, NØJLO, KEØYW, NØDJS, NØGXW, WDØGVU, KDØYYG, NØLIB, KDØTYG, NØPFR, NZØY, NØOWF, KC9KY, KDØMAD, NØEOF, KAØIAR, NØDN, KØKYZ, NØXTH, W9ZA, KEØIKT, N1TOY, NK9X, KEØJZE, KK6IQD, KEØCJM, KEØKOF, WBØSND, N9VHL, KEØLEL, NØNSP, NØPOD, WØCSG, NØZGR, WØZOE, N1ADR, KDØBQS, WB4UFA, KB4CRG, WØIFP, KEØOUO, NØGEX, KEØPQJ, KDØYUI, WBØAL, K3MJC, ADØXV, W9ZS, WØDMT, KIØTTY, KEØTNJ, KEØTTF. Special mention to my Aussie friends: VK2ZZO, VK5CP, VK3MJF, VK5SX, VK3VJS, VK3FDGM. KØYCV Paul, WBØSDZ Dolly, KØTMK Harold, WBØSEA Betty, WAØGGE Jerry, WØIFP Walt, WØRKU Carrol, KAØFXN Jean, KMØX Jim, KH6IQF Bill, WØEKM Bob, KC9KTP Brian, WB5OYL Gordon, N8ZR Steve, NØUHJ Joe, KBØAFQ Jim, KBØEQ Howard, KAØMJI Rod, AAØA Dennis, KBØMWG BILL, VK3NAY Brian, WØBOB Bob. *Original license call letter holders. Page updated Thursday, April 25, 2019 02:45:03 AM Eastern Time.